Burn is an injury caused by excessive heat: skin is affected first, causing tissue damage and blood clotting in the affected area. Can be caused by heat sources (stove lid, etc.). Extent of burns is appreciated by a percentage scale indicating the affected area of the body. Burn severity is assessed considering the depth and surface area affected, and the patient’s health and age. 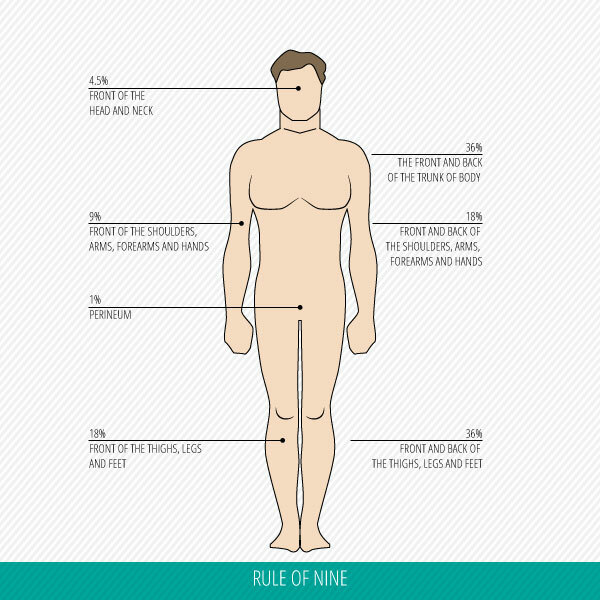 To estimate body surface affected, were used together, the method “rule of nine” and method “Lund-Bowder” – the most effective method is “Rule of Nine” which allows rapid estimation of adult patients (see Fig. 2 . ).This method takes into account the patient’s age. Lund-Bowder method (1944) is used for a more accurate assessment of burns by comparing the affected area as a percentage of total body surface (Fig. 1). The skin is the body organ that usually suffer the greatest injury from burns. In this case, only the top layer of the epithelium is affected, the main features of superficial burns are: skin is intact but shows signs of redness and is very sensitive at touching. On the skin minimal tissue injuries are visible, but the apparition of blisters is possible in a 48 hours timeframe from the initial moment of the injury. Lie in the deeper layers of the dermis and can affect the hair follicle or sweat gland. Has the following characteristics: the wound is white-yellowish, with large blisters, not very painful, presenting insensitive areas. It is necessary to apply a skin graft to promote healing, scar formation is influenced by graft technique. It is often difficult to assess the exact depth of the burn, many of which have varying depths. All patients should be reviewed in 48 to 72 hours after burn and watch until complete wound epithelization. Physiological response is immediately following an injury. Haemostasis is conducted by combining vasoconstriction to prevent blood loss with coagulants release factors that are as antibacterial barrier and as a framework for cell migration (Benbow 2005). Is normal cellular and vascular response at any damage (injury); healing can not progress if the inflammation does not occur (Timmons 2006). The duration of this phase is often higher in chronic wounds. Once wound contraction occurred, new epithelial tissue may develop at the wound surface. New skin cells begin to migrate from the wound edges, also form around of follicle of the hair, sebaceous glands and sweat glands (Timmons 2006). New epithelial cells are white / pink and migration stops once they meet other epithelial cells in the wound, a phenomenon known as contact inhibition. Epithelial migration is accelerated in moist environments, which makes epithelial cells to migrate more easily (Winter 1962). This phase refers to the phase of remodeling and sometimes can take up to 18 months (Silver 1994). In the case of chronic wounds, this phase may last for a longer duration. During epithelization, the wound starts to heal and the scar changes significantly the color (Timmons 2006). Since the 1980s, it was accepted that environment “wet” is optimal for wound healing. The concept was introduced by George Winter who, in 1962, conducted animal studies comparing the crust of wound treatet in „dry” environment,with the crust of wound treated in moist environment (covered with semi-permeable film). Results showed that epithelization was two times faster when wound covered with semi-permeable film. By 1980, Winter conducting other clinical studies which have confirmed that moist wound therapy has other benefits, such as reducing pain. Other studies have shown that autolytic debridement, is favored by moist environment (eg Freidman 1983). Dressings purpose is to absorb exudate from the wound and prevent its colonization by pathogenic bacteria. Superficial burns – can be painful, requiring analgesics. II degree burns – require cleaning with saline or water to remove debris sites. Traditionally, these burns are treated with dressings impregnated with ointment. Burns III and IV degree – are generally required excision of necrotic tissue and apply skin grafts for speeding healing. According to Clinical Investigation (EN ISO 14155): Burns surface decreased by 50% after 5,12 days of treatment with GANIKDERMA® products, their evolution towards healing, was made without notice side effects. Burn healing time ranged between 3 and 26 days depending on the independent variables of treatment such as lesion agent (flame, hot liquid, etc. ), subject age, and associated medical affections. The average time complete healing of burns, was 14,48 days, wounds was covered with newly formed epithelium tissue with high quality. Burns IIa degree, were healed in a range between 3 and 11 days, with an average of 7,56 days. Burns IIb degree, were healed in a range between 10 and 22 days, with an average of 13,07 days. Burns III degree, were healed in a range between 20 and 26 days, with an average of 22,83 days. In terms of burn volume, after 4,5 days of treatment, it was reduced by 50% and after 10 days of treatment, the average volume of burns represents 10% of the original. During treatment with GANIKDERMA® products, no burn was infected and had no smell. The average intensity of pain felt experienced by subjects at dressing made with GANIKDERMA® products removal from burn surface, estimated according Wong-Baker scale, was 1,05, which is a pain than can be overlooked. Dressings made with GANIKDERMA® products (Impregnated Compresses or/and Ointment), was changed on average every 2,07 days; ease of application and ease of dressing removal being assessed by doctors as a very good. It should be noted that dressing made GANIKDERMA® products change was atraumatic, without trauma to newly tissues (granulation and epithelization). Burns healing during treatment with GANIKDERMA® products ended with a very good quality of epithelium, with very good results in terms of aesthetics, without developing hypertrophic scars – particularly important in case of patients with burns located on facial or chest area, especially in case of female patients. This has a very positive impact on quality of life of patients who had burns, they managed to reintegrate into society. The above data prove great efficiency of GANIKDERMA® products in treatment of burns in terms of shortening the time of healing, a high quality of epithelization, Which has an important meaning in case of patients with burns localized on face or chest.